In October last year, I reported to my students that 26 out of 27 market economists were predicting a rate hike sometime in 2015. You mob are all out of your tree! As much as I’d like to say that my ability to get this right when so many econo-nerds got it wrong was based on some super-brain understanding of markets, or an ability to read Glenn Stevens’ ice-cold poker face, I can’t. In fact, it’d be fair to say that there was a fair ‘herd’ of people expecting a rate cut sometime in the early part of 2015. I was one of them. But hey, I’m not afraid of being part of a herd when the herd’s running in the right direction. And right now that direction is still driving towards lower rates. You’d have to think at this point that the RBA has got at least one more rate cut in them. We know they tend to move in batches. So odds are favouring another rate cut in March. Whatever the case, the ‘lowest interest rates in a generation’ are now the new normal. The question we should be asking as investors though is what happens when interest rates rise, and when is that going to happen? And this is true. Or at least used to be true. “Interest rates have to be positive” also used to be true. But not anymore. The US, Japan and Europe have shown us that interest rates can be zero, or effectively negative – and for long periods of time. It’s a new age. We boldly go where no economies have gone before. And no one really knows how it’s going to play out. But sure, rate hikes are always a possibility. So what kind of things might cause a hike in interest rates? Well the thing to remember here is that the RBA effectively only has one mission – to control inflation. And so the question about rate hikes is really a question about what might cause a sharp pick-up in inflation. And from where we stand now, it’s very hard to see where inflationary shocks might come from. In fact, central banks all over the world are desperately trying to stave off deflation – falling prices. And mostly this is due to the massive productive capacity that’s been unleashed in China and the developing world in recent years. Stuff is just getting cheaper – in a massive way. Take small electronic devices – one of the components of the CPI. 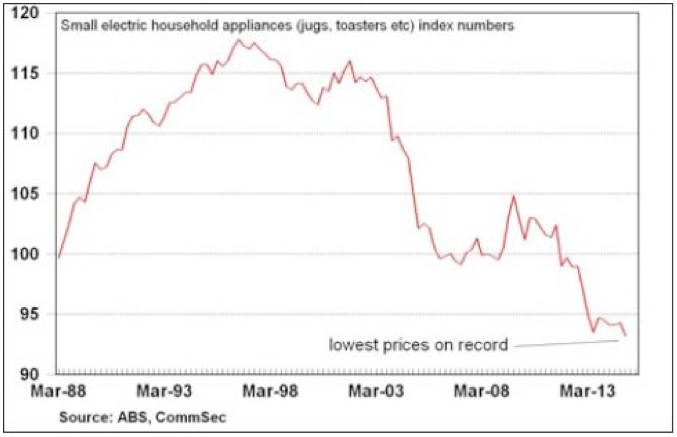 Prices for toasters and kettle and fans and all that are now at the lowest level since records began back in the 80s. Or take women’s clothing. 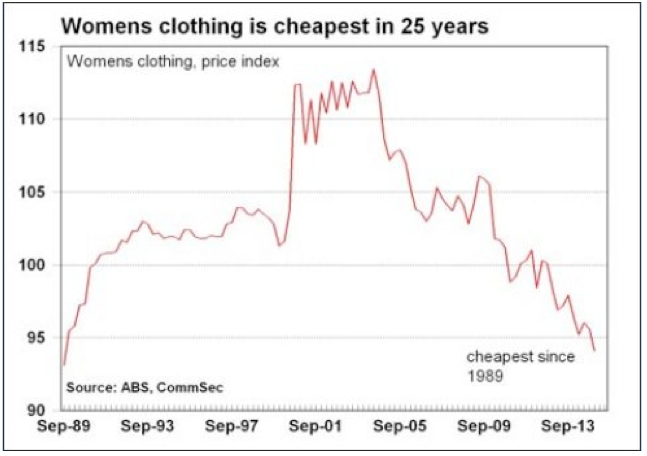 They’re now the cheapest they’ve been since 1989. For pretty much anything that’s made overseas, we’ve seen massive falls in price. Computer, musical devices, white goods… You can buy a brand new car for less than $12K! Sure it’s a hatch-back fart-box, but still. So it’s against this massive, global, deflationary headwind that central banks are trying to manufacture some kind of positive inflation. And is this going anywhere anytime soon? No way! In fact, it’s only going to get worse. Not only are more and more developing countries adding their talents to the pool, but we’re on the cusp of a technological hyper-age, with 3D printing, driverless cars, drone delivery and who knows what else. Ok. So could we see some inflation come through some sort of energy shock – like the way the OPEC crisis in the 70s triggered some crippling inflationary times. Personally, I can’t see it. The trend in energy prices lately has been nothing but down. And modern economies are likely to be a lot more resilient than they were. We’re more diverse in our energy mix these days, and more able to pivot quickly to alternative sources of energy if there was a price spike in one market. And I think central banks would be aware what a hit to economic activity it would be, and so wouldn’t lean too hard on interest rates anyway. The only thing they’d need to make sure is that people didn’t expect inflation to continue (Prices are another area where expectations create reality). But Glenn Stevens has a jaw-bone and he’s not afraid to use it. So for me, right now, I can’t really see where inflation is going to come from. Ok then, what if everything pans out fine, and the economy starts growing quickly again. Will the RBA want to move from a stimulatory to a more neutral stance. Sure. Probably. But where is ‘normal’ or ‘neutral’ these days anyway? The whole world’s gotten used to lower rates. We’ve adjusted our borrowing accordingly. Rates have been so low for so long, that people have factored current levels into their budgets. That means that even a handful of rate hikes is really going to be felt. If you wanted to put a break on things, you only need to bump up rates 1, maybe 1.5%. To me, all this means that record low rates are the new normal. It’s the new economic reality. Lock in lower rates for now, I reckon. But I’ll let you know if anything changes.